In one of our previous blog entries, we mentioned that finding a job takes work. It’s true. Obtaining employment requires persistence, patience, and determination. There are a number of ways to develop these skills to increase your odds of landing a job. In addition to just putting in a bunch of applications and following up a few days later, job seekers, especially people new to the workforce, should practice filling out applications. If you’re new to job hunting, there’s a good chance you’ve never filled out an application. We’ve put together a sample application of our own as a tool for young persons looking to enter the job market. Fill out the form directly on your desktop or laptop using PDF editing software, or print out the form as many times as you’d like to get a better idea of what many companies ask for on applications. Getting in the early practice using a mock form will help you build confidence and familiarize the process of providing detailed information companies often require on hiring documents. Our form follows the basic structure of entry-level applications for companies in areas like the retail, fast food, grocery store, gas station, or coffee shop industry. Many companies in these industries only offer paper applications available as downloads from careers pages. Applicants often find the documents on hand at local establishments, as well. Either way, the forms feature similar data fields asking for contact information, the position desired, hours of availability, verification of right to work in the U.S., age, past employment information, and education history. 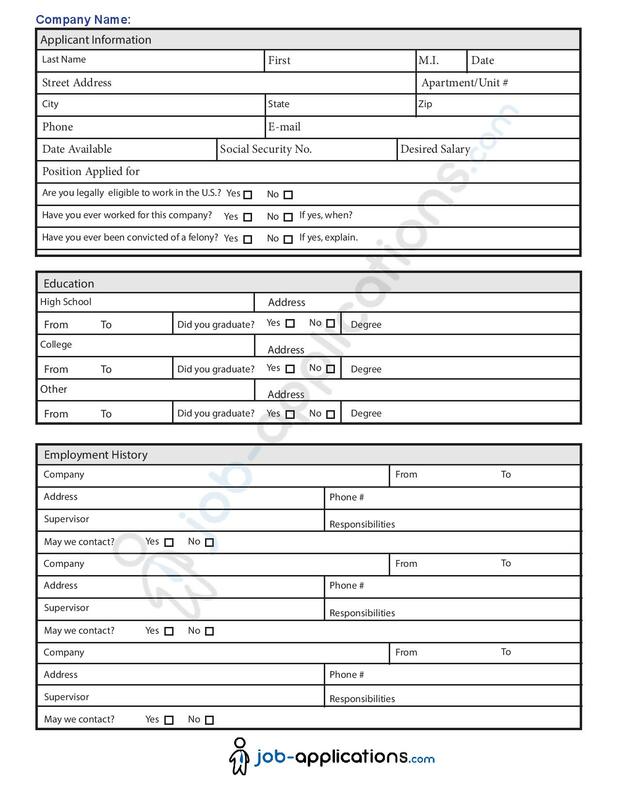 Since our sample job application contains all of the fields on regular hiring documents, you can even use our downloadable form to apply for a job at many businesses. If you don’t have any past employment experience, don’t worry. Leave the section blank or think of chores or tasks you’ve taken on that are similar to working a real job, such as babysitting, running a paper route, or mowing neighbors’ lawns. Remember to be truthful. Lying on an application gets you nowhere. When in doubt, ask a parent, teacher, or some other trusted adult to help you fill out the form. Use our form to your advantage. Print it out or fill it out on your computer by enabling editing through your preferred PDF reader. You can also save the file to your computer or simply visit this blog post again when you need to print out the sample job application in the future. We hope this helps in your job search.